Job seekers come to Morningside from different funding sources, such as Developmental Disabilities Administration, Department of Vocational Rehabilitation, Local School Districts, Social Security Work Incentives and Private pay agreements. For more information by phone or in person contact our office at (360) 943-0512. Once referred, a meeting will be scheduled to complete releases, orientation paperwork, and other required documentation. Intake meetings can occur at each of our offices, at school, government building or a private residence, depending on customer preference. Typically the first program entered by the individuals we serve, Discovery or Community Based Assessments are created to determine person centered goals & identify work related interests and skills. Some activities may involve: trying out different types of jobs, getting to know preferences, aspirations, determining transportation, going on job site tours, participating in informational interviews and more. Our planning process is a highly individualized and person centered approach to develop objectives, timelines and assign activities resulting in outcomes for our stakeholders. Larger goals, like “Obtaining a full time job as an Administrative Assistant for the State of Washington” may be broken down into smaller steps, such as “Obtain basic imaging skills through internship” or “Participate in 7 mock interviews to hone communication skills”. Plans are updated every 6 months with progress reports and when major life changes occur. Once an individual has determined their vocational goal, we begin the process of developing a position that meets the customer’s criteria with regards to location, hours per week, time of day, type of task and other details that might determine a successful job match. Tours of job sites and business analyses are conducted to ensure the essential functions of each position are a match for both the program participant and the employer, resulting in a Win-Win. 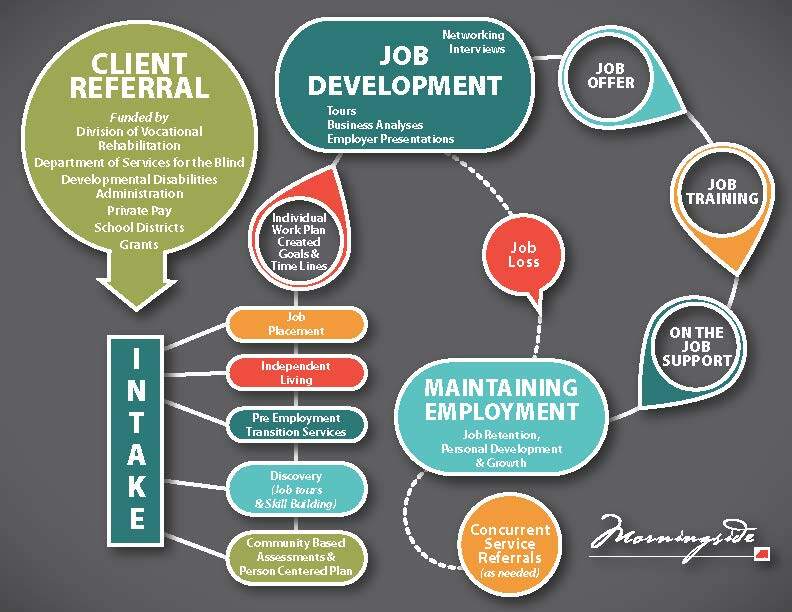 Customized jobs are proposed to employers on an individual basis and each relationship is nurtured to ensure Morningside’s reputation as an agency that prides ourselves on using “national best practices” in Job Development. Individuals with a work history and pre-determined goals may join this program as their first step. The level of support provided during a job start or initial training period will be determined by the individual’s preferences and needs. Some customers will have access to a job coach (staff person who assists in learning job tasks and strategies to work independently) for an entirety of the shift and others will utilize phone or check in visits daily or weekly to help problem solve as issues arise or create accommodations that may be needed. Typically a training period and level of support is identified prior to the job start and needs are re-assessed after the job is deemed stable, at approximately 90 days of employment. Individuals who have short term funding, like DVR, may choose to exit our services after it has been determined that they have learned their job and are stable. Individuals who prefer long term support on their job can utilize a job coach for the entirety of their employment and job development services can be “re-started” if a second or different job is desired or if a job is lost for any individual. Some benefits of a long term job coach include, regular communication with manager and ongoing additional training support as needed, advocating for additional hours or wage increase, task modification or problem recognition/solving supports.